At the end of this season there will be changes to the way the Non League Pyramid works and as we enter the final stages of the season it’s worth reminding ourselves of these changes and what it could mean to the clubs involved. 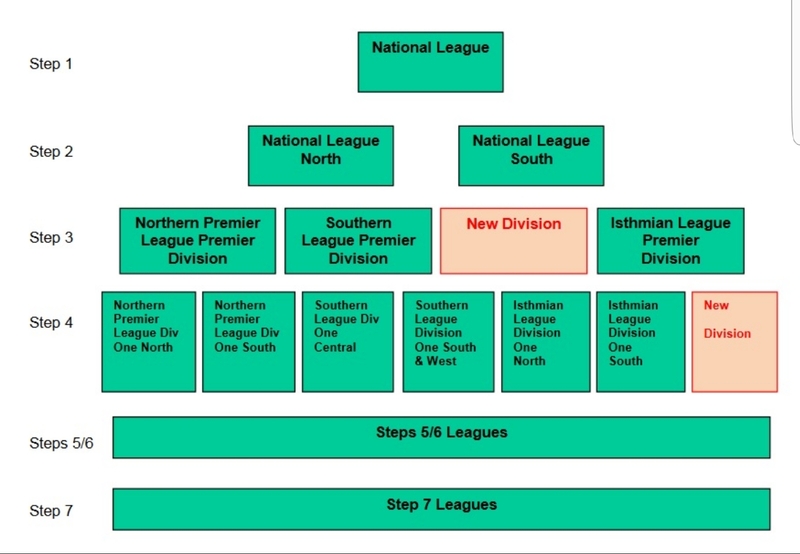 *A new League will be added at Step 3, it will be run by the Southern League and will be based around the Midlands. *The four new Leagues will consist of 22 clubs each, previously it was 3 Leagues of 24 clubs. There will now be 88 clubs at Step 3 instead of 72. *This season only one team will be relegated from each of the three current Step 3 Leagues. *Promotion is the same from Step 3 this season, 2 go up from each of the three Leagues and 3 come down from the two National Leagues. So it is a straight 6 for 6 team swap. *More teams will come up from Step 4 to help fill the extra League. Champions, runners-up and play-off winners from each of the 6 Step 4 Leagues. *A third-placed Step 4 team with the highest points per game average across the six Leagues will also gain automatic promotion. Their play-off place will go to the 7th place team in that League. *Teams will be regionalised into the four new divisions at Step 3 once all the promotions and relegations have been settled. *A new League will be created at Step 4 pushing the number to 7. It will be run by the Isthmian League and be based around the Midlands. Each League will contain 20 teams. *This season only the team finishing bottom of the six Step 4 Leagues will be relegated. *26 teams will be promoted from Step 5 rather than the usual 14 to help fill the New League. So aswell as the champions it will be 12 second place teams with the highest Points Per Game average across the 14 divisions. So in short summary there will be an extra League at Steps 3 and 4 meaning better regionalisation, less travel costs and all Leagues will contain a reduced number of teams. As with all Promotions and Relegations between Leagues the FA will have final say and will confirm all movements at the end of the Season.